Built in 1901, and named in honor of university graduates who contributed to its construction, Alumni Hall originally housed a chapel, drill hall and gymnasium. Designed by the architectural firm of Newman, Woodman & Harris, today the exterior is largely unchanged, although the interior has been dramatically altered and renovated. Weekly chapel attendance was compulsory for students from the time of the university’s founding until 1925. In 1934, the chapel space became administrative offices, utility shops and the Little Theatre. University officials assigned the gym to female students after Memorial Gymnasium was built in 1933. 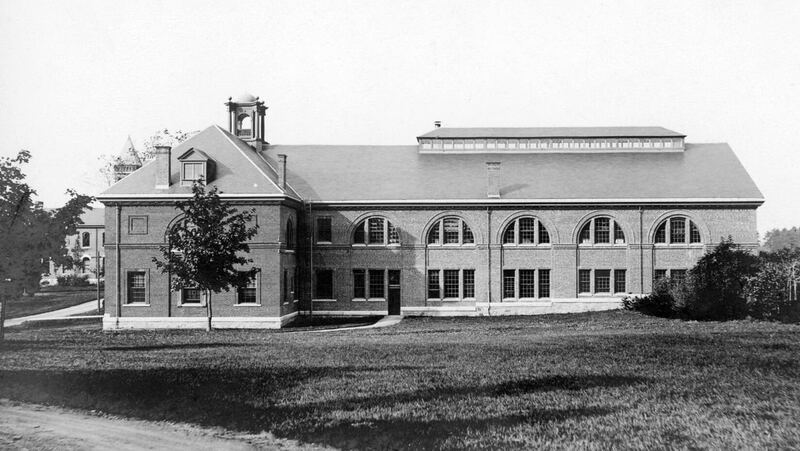 After the construction of Lengyel Gymnasium for women, Alumni gym space was used as a public television studio, storage and offices. Part of the original gym space now houses the Division of Marketing and Communications. The remainder of the building is used as administrative office and support space for senior staff and a variety of other staff and programs.